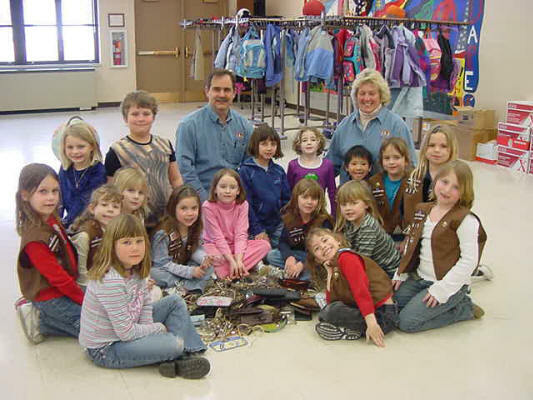 November 2003 -- Young ladies from Brownie Troop 671 Manitou Council at Waters School collected over 100 pairs of glasses during their Food Collection in early November. Troop leaders Claire Courtemanche and Christine Heschke found a program on the web called "Sight Night" which urged groups to collect used eye glasses and turn them into their local Lions Club. Tom and Betty Clausen visited a troop meeting to thank the Brownies and explained that the glasses will be donated to needy people in foreign countries by Lions missions.